Look no more for a super moist and tender carrot cake! 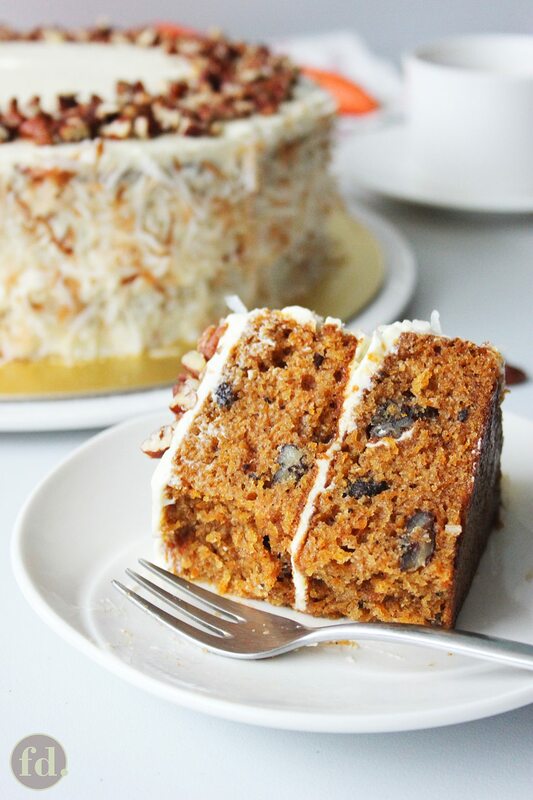 With loads of freshly grated carrots, sweet currants and chopped pecans, infused with ground spices, filled and topped with an ultra smooth and creamy cream cheese frosting, and for a twist of flavour from the tropics, decorated with toasted coconut flakes on all sides, this carrot cake is the ultimate! I know I probably say this for just about every cake I like, but I utterly adore carrot cake. Would you be surprised to know that I make it almost a life mission of mine to find the best of the best carrot cake recipes? I know that sounds extreme … but I’ve had this love affair with carrot cake for as long as I can remember. So when I was asked recently to make one for an upcoming birthday, I was elated! It gave me an excuse to launch into an all-out search for the next great carrot cake recipe. I felt like I was on my own set of ‘The Great British Bake-Off’ to be honest, with me baking one recipe after another, tweaking combinations and proportions, learning from mistakes and errors, adapting with each subsequent bake, almost every other day, until I finally arrived at this ultimate carrot cake. It’s everything I dreamed my perfect carrot cake to be. And when friends tell you that it’s one of the best they’ve ever tasted, you know you’ve got something special! Thanks, in no small measure, to Inspired Taste’s take on Smitten Kitchen’s carrot cake recipe. Now, let’s dive into this cake, shall we? But let me just shout out that this is truly a super moist, tender, and utterly delicious carrot cake?! Oh my, you’re going to love it! It’s ridiculously easy to make too! In fact carrot cakes are just about as easy as baking my favourite choc choc rum brownies. 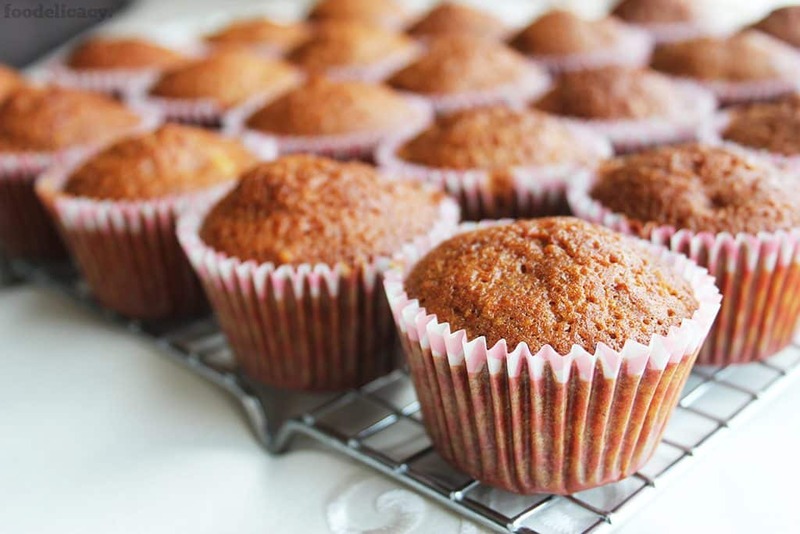 If you prefer to enjoy carrot cake as cupcakes, this is also the perfect recipe! There should be enough batter to make 24 cupcakes. Here’s how simple this recipe is. And you can do it all by hand, no need for a mixer! We combine all the dry and powdered ingredients together (except the sugars). Separately, we whisk all the wet ingredients together (sugars are added here). Then we gently fold the dry mixture into the wet, just enough to get a smooth and lump-free batter. That’s most of the hard work (if I could even call it that!) done. Lastly, we add all the good stuff that brings together the flavours of a carrot cake – why, freshly grated carrots of course, and loads of it too – 3 cups full (yes, you’ll really want to put in that much! ), but I promise you that the taste of carrots are not going to dominate or overwhelm the cake, instead it’s going to sweeten things up a little more, but more importantly, impart that lovely moisture into the cake, and that’s what we want! You can decide if you’d like your carrots finely or roughly grated, or a bit of both. I have found that finely grated carrots result in a finer crumb (see photo below) that holds together so much better, but that’s just me. Oh, let’s not forget the other little ‘big’ stars too, in the creation of this wonderful carrot cake. I think spices are so essential in carrot cake, and being Asian, we cook and bake with spices so much that it’s hard to imagine food or desserts without their earthy flavours, warmth and aroma. I love to throw together spices that harmonise beautifully in cakes – here, ground cinnamon, nutmeg and ginger, altogether, are a must, and really gives the cake that little extra special ooomph! For added texture, I like to throw raisins or currants into the mix, though currants are my personal favourite. I love that they’re as small as chocolate chips, which makes slicing cake portions a breeze and a lot neater (plus they don’t leave such big gaping cavities if they do drop out!). Last but not least, do you go nuts over… nuts? I do, and I find that pecans work amazingly well in carrot cakes (I don’t think I could ever eat a carrot cake without nuts! ), and walnuts are a popular favourite as well in carrot cakes. As with currants, I like having nuts chopped up to about the same size as currants. This way, you can get those picture-perfect, neat cake slices, and still enjoy a good nutty crunch in your bite (you’re probably starting to sense that I’m pretty obsessed with getting neat slices out of my cakes, yes?). 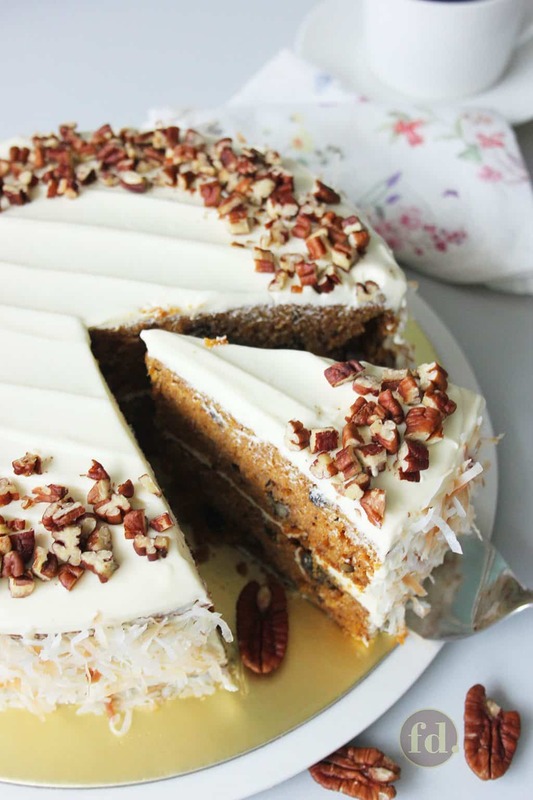 This recipe is very versatile and forgiving, You can work in your favourite fruit, nuts, spices, even liquors, but I highly recommend that you try this as is … just so you can taste for yourself what makes this back-to-basics kind of carrot cake so deliciously good. 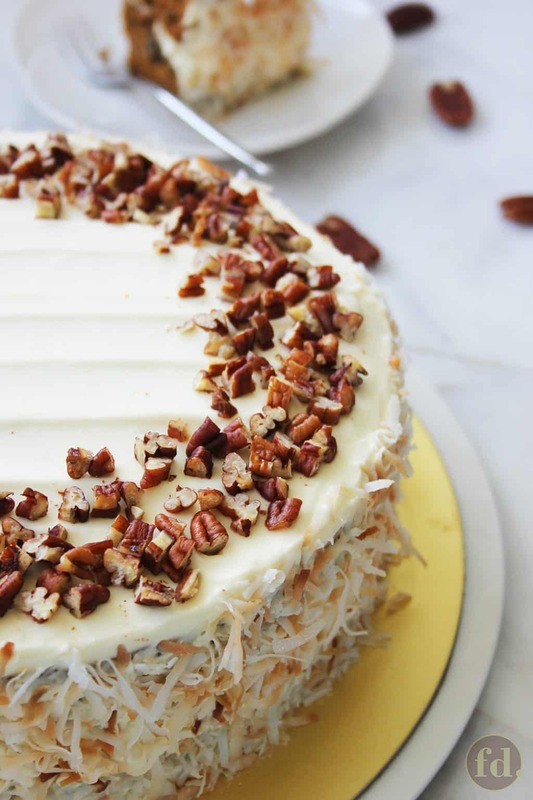 But the real icing on the cake, we all know, the stuff that really defines the unforgettable taste of a carrot cake is undeniably, the creamy, decadent cream cheese frosting! Though this cake tastes so good without the need for dress-up, cream cheese frosting and carrot cake are like peas in a pod. This is where this ultra smooth and creamy cream cheese frosting comes in! The frosting is as suggested in the original recipe and doesn’t require any butter, but my own tweaks on that frosting recipe, were to add dashes of vanilla extract and a little rum. Use a flavoured liquor if you like – amaretto or cointreau should go really well too. A squeeze of lemon juice to blunt the sweetness, and that’s your dream cream cheese frosting all done! This makes a softer, but very spreadable frosting. If you want a firmer or pipeable consistency, you’ll want to reduce the amount of heavy cream till it’s at the consistency you prefer. Even a delicious cake needs a pretty, elegant, and tasteful finish, don’t you think? And because I’m from the tropics, coconuts are kind of my thing! If you can get your hands on juicy coconut flakes (the packaged kind), toast it and dress the sides with it! 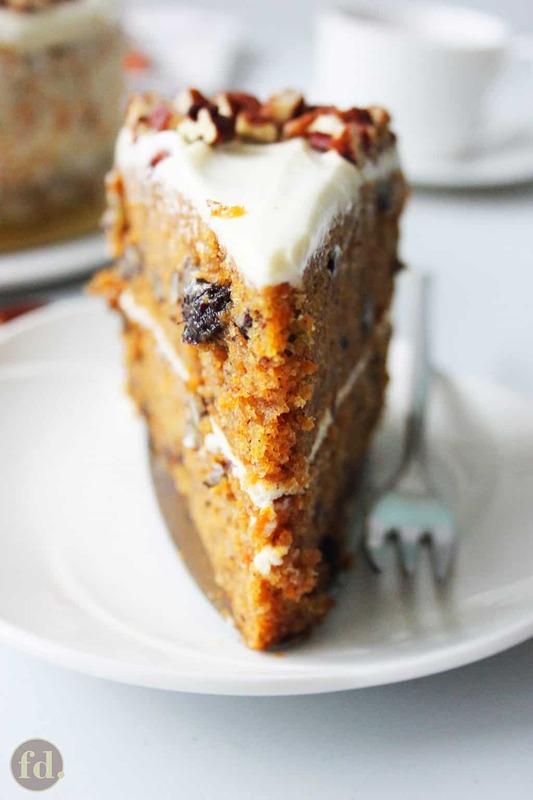 It adds such a wonderful flavour and texture to this already sumptuos carrot cake! 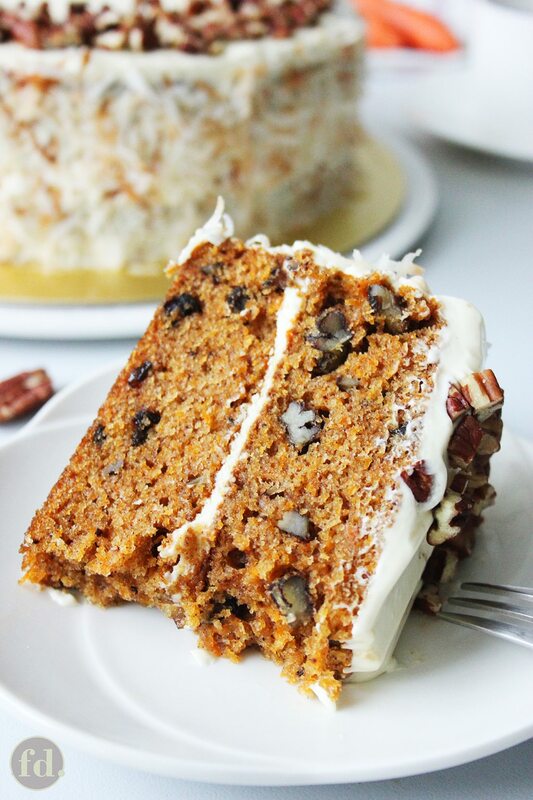 This incredibly moist and tender carrot cake has all the goodness of freshly grated carrots, sweet currants and chopped pecans, spiced up with ground cinnamon, nutmeg and ginger, and a lusciously smooth and creamy cream cheese frosting to die for! Pre-heat oven to 175 deg C (350 deg F). Grease the sides and base of two 9-inch (23-cm) round cake pans. Line the base in both pans with baking paper, then lightly grease the top of the paper. In a medium bowl, combine the flour, baking soda, salt and ground spices, and stir with a whisk until well mixed. In a separate bowl, whisk together the oil, sugars, and vanilla extract. Whisk in eggs, one at a time, until well incorporated. Sift in the flour mixture, in 3 parts. Using a rubber spatula, gently fold each part into the batter, scraping down the sides and bottom of the bowl, until the flour disappears. The batter should be smooth and free of lumps. Fold in the grated carrots, currants, and chopped pecans all at once, until well distributed throughout the batter. Divide the batter equally between the prepared pans. Bake for 35 to 45 minutes, or until the tops of the cake spring back when touched, or until a toothpick inserted into the centre of the cake comes out clean. When baking is done, let cakes cool in the pans for 15 minutes, then turn out onto cooling racks, peel off the baking paper and allow to cool completely. Using an electric or hand-held mixer, whip cream cheese on medium speed until smooth and creamy, about 1 minute. Beat in the icing sugar, 1/4 cup at a time, until well incorporated. Taste the frosting as you add each 1/4 cup of sugar, to your desired sweetness (you may need a little less or more), each time beating until fluffy. Pour in the cream, vanilla extract and rum (optional) and beat on medium speed for 1 minute. You may not need to add all the cream, if you prefer a thicker or pipeable consistency. Chill the frosting for 15 minutes, to firm it up a little, to make spreading easier. When the cake layers are completely cool, using an offset spatula, spread 1/3 of the frosting on top of one layer, place the other layer on top, and spread another 1/3 of the frosting. With the remaining 1/3, spread a thin layer all around the sides. Smooth the top and sides of the cake. Using your palm, gently press in toasted coconut flakes on the sides. Scatter toasted, chopped pecans on top as desired. Chill the cake, covered, until ready to serve. Carrot cake always tastes better the day after when the flavours have had time to come together beautifully, so it's best to bake this cake at least a day ahead. Hi Ctasds, I haven’t done this myself but from what I’ve read on ingredient substitutions, yes, you can replace plain flour with equal amount of almond flour. However, I understand that almond flour also typically requires more egg or binding agent, so the recipe may need a little adjusting. Hope this helps you! Hi Celia, can i replace the plain flour with almond flour? If yes, is it same measurement? For the filling and frosting, it all depends on how you’re going to frost and decorate your cake, so I’d leave it as is since it’s going to be a square cake, more is better than less just in case! Hope it all works out! Let me know, ya? 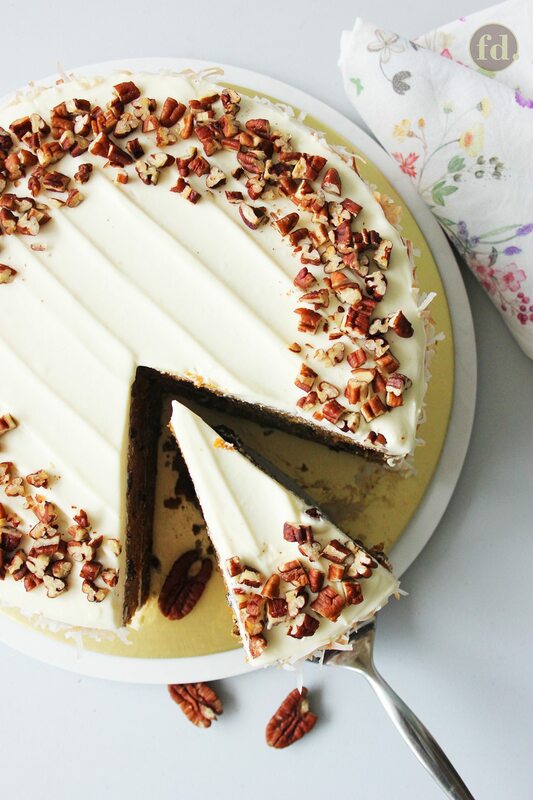 Hi Celia I love this recipe so much and I’m going to make this cake again for my mom birthday since she likes it so much ❤️Just a quick question ……only me and my mom likes carrot cake my dad doesn’t really fancy carrot or the spices ?both of my sister doesn’t like carrot cake (they’re weird ?) my oldest sister likes it but she’s in university and can’t just come back for my mom birthday so I was hoping to make a smaller cake could I make this cake in a 8 inch square cake pan how should I change the recipe (my mom’s birthday is on Oct 29 ) I would be so grateful if you could get back to me sooner ☺️THANK YOU SO MUCH FOR THIS WONDERFUL RECIPE ? Thank you for the most moist Carrot Cake. Compared to other recipes I have tried, yours is the best. I replaced Pecans for Walnuts. Hi Yin! I haven’t quite been able to work on the equivalent in ounces/grams for this recipe, but as a quick response in case you’re looking to make this delicious cake really soon, here’s a reliable source of baking conversions I found online, at http://www.thekitchn.com/weight-conversions-for-flour-sugar-and-other-common-baking-ingredients-171316. Hope it works for you! I’d love to hear how it turns out for you!? May I know how much is one cup equivalent to? I understand that different countries use different measurement for cups. May I know in this recipe, what is the amount? Thank you! Hello Angela, thank you so much for dropping by! ?I’m so glad you like what you see, and I really am looking forward to you trying the recipes here! Please do share, ya, I’d love to hear from you! Happy cooking & baking! Take care!? Thanks Celia for your generous sharing of your mouthwatering recipes. Enjoyed viewing the lovely photos of your cakes and dishes. I’m going to try baking the carrot cake for the first time. You could always reduce the whipping cream, it will make your frosting less runny too if you’d like it a little firmer. It’s really easy to get the line patterns on the frosting – I used an offset spatula and ran lines with the flat side of the blade across the top of the cake, wiping the spatula clean each time. Hope you’ll try it again, it really is such a delicious and moist cake!? Thanks so much, Sharon! That’s awesome to know! The frosting must have been so delish with the dash of lemon juice and zest too!??? Thanks for your recipe. I made it last night and it was delicious. For the frosting, I added some lemon juice and zest. Thanks again. Oy Len, thanks so much! I’m so glad you found my space too!?? 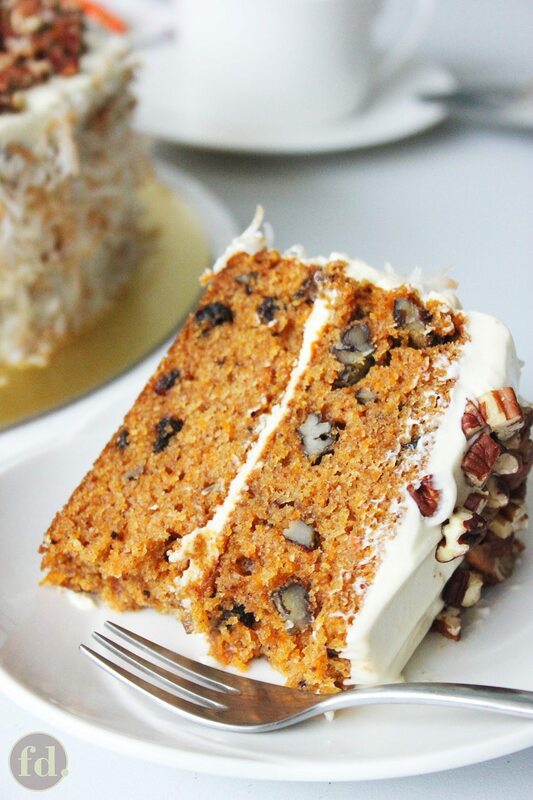 This carrot cake is truly delish! Hope you give it a go, it’s super easy to make! Btw, my butter cake post is now updated! Keep sharing your cooking journey with me, ya! OMG Celia, another yummy cake. Love your pics. And I love that you make it sound so doable. One more cake for me to make ? I am so glad I stumbled onto your space.